Kanye West Stands Alone : The Record On his new songs, the rapper points fingers in every direction, including back at himself. 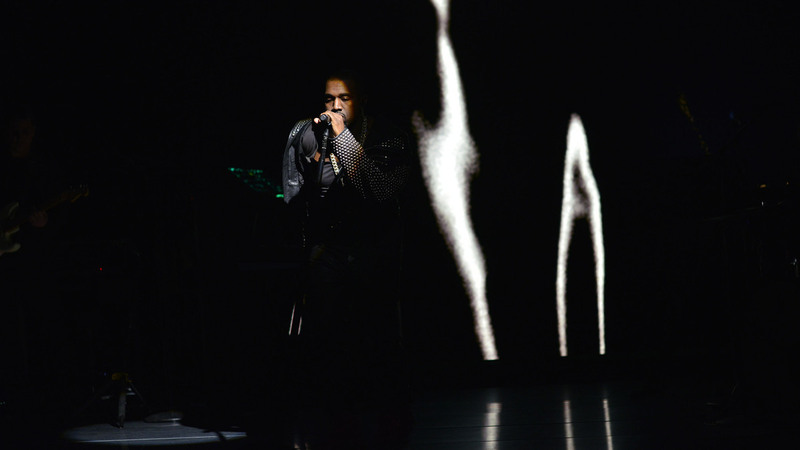 Kanye West performing "Black Skinhead" on Saturday Night Live last weekend. What happened over the weekend? At 8:34 on Friday night, Kanye West tweeted. He said he'd be premiering a song in a half hour and we'd have to do what he said to hear it – we'd have to go to a particular address and stand outside with other people and watch a video projected onto the side of a building. Of course, the first video of the video was up within minutes, so most people didn't have to do any such thing. "New Slaves" spread, the texting and Vineing and opining ran rampant. A few hours later even Michael Moore was Rap Genius-ing the song. The next night Kanye was the musical guest on the season finale of Saturday Night Live, where he premiered another new song, "Black Skinhead," performed "New Slaves" for the first time and stood alone while the cast hugged around him and the credits rolled. He came for us on wavelengths old-fashioned and new, inserting into our conversations two songs that are stacks of questions without answers. Received as part of Kanye's 15-year career, they make sense – from the composition that is both heavy-handed and deft to the singsong retort of his flow and the lyrics that combine insecurity with callous certainty, that decry consumerism while refusing to give it up, that drag internal conversations in front of a mass-market, hair-trigger, blinkered audience. "New Slaves" is the "c'mon, c'mon" in the "All Falls Down" hook 10 years and millions of dollars later. He's got more on the line now — a decade of living has made him less inclined to sugarcoat. This new song is a rotund, hollow production over which the man who made "Jesus Walks" and "Slow Jamz" and "Drive Slow" and "Runaway" and "Can't Tell Me Nothing" looks us dead in the eye and raps about the proximity of Jim Crow. He says things about the government that would have been dangerous 30 years ago. He airs out the music industry. Other rappers are doing this, but Ye also admits fault and weakness every time he mentions a Maybach. He is balling out on every level, especially emotionally. He's made so much money anticipating our desires that he now has the capital and the connections to push our buttons whenever he wants. How does a very rich and eminently successful artist with a superstar-all-from-a-home-movie girlfriend call us out? "Black Skinhead" is somebody banging on your door in the middle of the night, hurtling out of Ye's metal-plated face, predicting reactions before it's halfway over. He rides an industrial-sounding, stadium-sized beat, calling Chicago, "Chiraq" in a grainy echo. He associated himself with Malcolm X on "Good Morning," but then it was a joke. This time he's serious. He says he's going 400 mph, which we believe – he's taken corners on two wheels on live TV before. In the Saturday Night Live performances Ye hit all his marks. He mostly controlled his delivery of FCC-banned words – but not all the way and half the slipups felt intentional. His set design is as composed and emphatic as it has been since he started working with Es Devlin. It's invigorating and ominous. His bare-chested DJ couldn't restrain himself, and the SNL audience was in full-throated support. That was good to hear, because Kanye isn't exactly beloved. Not everybody gets it. On record and in public, he's asymmetric and flustered just like a regular human being is, but unlike rap you'll play for your kids, rap songs about shopping at Goodwill, rappers who are safely in the past. What's popular, on the sales charts, on the radio, at the festivals and in hip-hop today is EDM. And EDM has a lot of things, but it's short on words. Kanye has words for days — words that don't agree with each other, ambiguous pronouns, homonyms, insults, "Strange Fruit" quotes. There are ideas in "New Slaves" and "Black Skinhead" that are echoed in the editorial pages of The New York Times, but Kanye's songs give them volume and heart. They are a reminder of what music can do — and the isolation artists feel when they say things we don't want to hear. People need to stop saying hip-hop is dead. There are brave people making it, and we should be proud.